Ian McDonagh receiving his award. 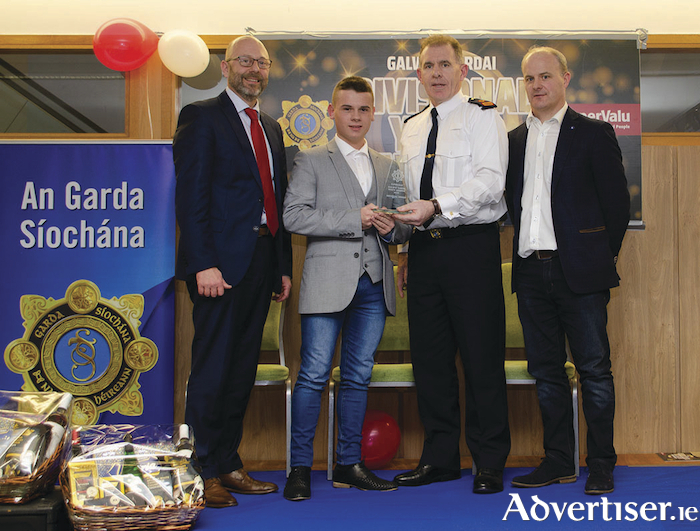 Galway Divisional Gardai held its inaugural Garda Youth awards ceremony on Thursday at Galway Racecourse. The awards recognise young people, from all corners of the Galway city and county, for their goodwill and contribution to society, courage, and resilience in overcoming emotional and physical trauma in their young teenage years. Special guests on the night included Galway senior hurling manager Micheal Donoghue, and Frank Byrnes of Auto Body Repairs, Oranmore, recognised by the Galway JLOs for giving young people at risk a second chance through employment. Other dignitaries included Brian Sexton, Musgraves regional manager, Supervalu branch managers, city and county mayors, Níall McNelis and Seán Ó Tuairisg, Cllr Terry O Flaherty who was responsible for the nomination of the main winner in the individual category, and Judge Mary Fahy, along with the various officers and members of An Garda Siochana, and the young people and their special guests. There were four nominees in each of the categories, Individual, Group, Special Achievement, and Community Safety. Ian is a student of Merlin Secondary College, Galway city. A strong community activist, he has been communicating with local councillors on various issues since he was 11 years old. Dedicated to his school, Ian shows other young people how important it is to support the community as well as showing young traveller children how important it is to have a voice and to stay in education. He was nominated by his vice principal and by his local county councillor Terry O Flaherty. G roup award winners: Ban Garda Y outh diversion project group. Four lads from the Baile an Choiste area of Galway city have made a positive contribution to their community by building a recording studio in their local community house. They took it upon themselves to build a resource that the entire community could benefit from. It offered a huge resource to an area with very little amenities. They have encouraged other teens to engage in the service, which has seen a huge decrease in anti-social behaviour. Sinead is a first year student in Ard Scoil Mhuire, Ballinasloe. Diagnosed with a brain tumour in November 2018, Sinead has undergone three major surgeries but has shown immense courage and optimism since her diagnosis. Her class and indeed the whole school have been greatly moved by her plight. Sinead loves school and coping skills have been a source of inspiration to everyone who both know and meet her. This group of young adults, from the surrounding areas of Ballinasloe, have learnt how to perform and deliver classes in cardio resuscitation, basic first aid, automated external defibrillator, water safety principles, water base rescues scenarios etc. They meet every Saturday from September to Easter to deliver classes to young people and have self-funded the assistant swim teacher course. The group is mature in their ages, responsible, always on time, appropriately dressed, and more importantly are willing to learn and take instruction and guidance. All of these young people give their time voluntarily and for the good of their local community. Irish water Safety Ballinalsoe is extremely proud of this group of young people, who through classes and trainings, are fostering a culture that encourages safer attitudes and behaviours in all those who live, work, and play near the water. The Frank Byrnes award, presented by An Garda Siochana in association with Frank Byrnes, was presented to a group of five young people (Sean, Niall, Samuel, Dara, and Brendan ), who on the October 28 2018, were alerted to a person in distress in the water by onlookers on the shore, while they were on route to tie up their RIB. In fast flowing river conditions, the boys managed to locate the person in the water, and were able to pull him aboard the boat to safety. He has since made a full recovery. The five boys acted selflessly to save a person’s life. They carried out their actions in accordance with the water safety training skills they learnt from the Irish Water Safety. Their actions instilled a sense of pride in the community, and were recognised with an award from the Irish Water Safety.